As many people have speculated based on my sewing output (keep in mind that I don't buy RTW, so what you see is what I get), I have a very full closet. I like to delude myself into thinking that I have a normal amount of clothes, but then I visit friends and even the fashionable ones seem to have fewer pieces than I do. Clearly I need to make some more clothes-horsey friends. However, I am good about purging unworn pieces from the closet on a regular basis. I really do wear (almost) everything in there. I used to have a hard time getting rid of clothes I had sewn. I think we all have a primitive instinct to preserve pieces of ourselves, and an item I've made with my own hands seem like a piece of myself. However, my discovery of Pattern Review in 2006 and blogging in 2007 means I have photos and recollections of most of the things I make and that is enough to satisfy me. I do fret a bit that my custom clothes are probably thrown away/recycled by the good people at Goodwill because they don't have size tags and the perception that homemade=low quality, but once I part with them I must relinquish control over their anthropomorphic fates (in the other direction madness lies). I don't have a car but do car share with a neighbor: in exchange for parking in the parking space that I purchased, he lets me drive once a month (or more often if I ask, but I don't usually need to). However, he got rid of his car in January and didn't get another one until this month so I had a MOUND of stuff to take to the Goodwill (exhibit A on the left--and that's before I cleaned out shoes and skirts). 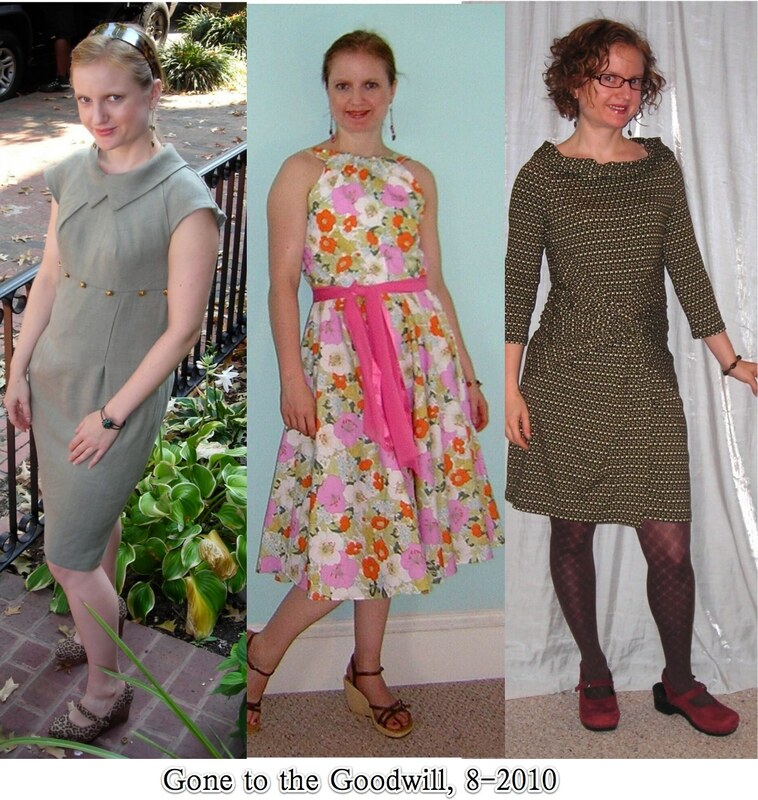 I said goodbye to several old friends as shown in the photo at the top of the post, such as my Sherlock Holmes dress (the swayback problem was just too awful), my Tippi Hedren dress (ditto, and I hate the offset on the front stripe and the bagginess under the arms), and this Butterick 4792 retro dress (the front bodice/neckline is just awful on a small bust and there's no getting around it)...and many, many more. Another old friend pre-dated my PR/blogging days. I made it for the 4th of July 2005--the contrast red band has little stars on it for the holiday. 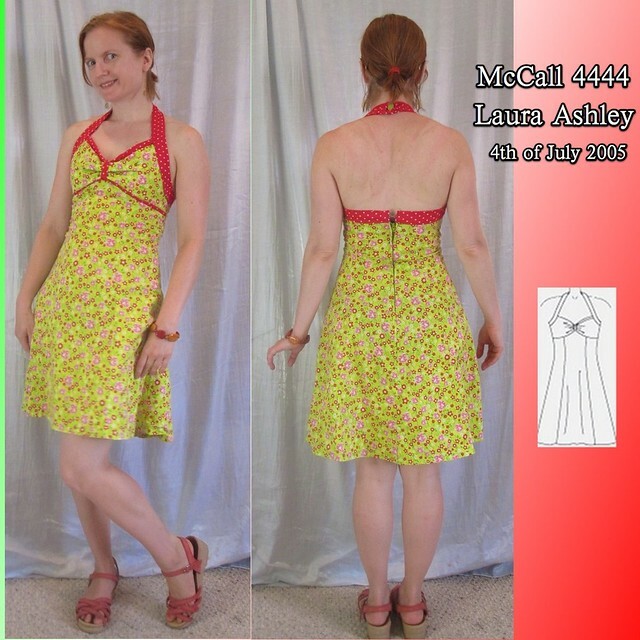 I love this little dress, classic Laura Ashley McCall 4444. However, the time had come to acknowledge that the print (it's fish and flowers) is too juvenile for my nearly 36 year old self and I was uncomfortable when wearing it as my belly pops the skirt out a little. To ease the pain of parting, I took some photos. Now it lives on and will hopefully be enjoyed by someone a little more age (and size) appropriate for it. And now I have to acknowledge: the bad thing happened. Even though I cleared out at least 35 pounds of clothes and shoes, the closet was still full to bursting. My suits (I do own some, but wear them only under duress) were getting creased and wrinkled from being shoved together too tightly. So I bought a freestanding clothes rack and set it up outside the closet. Yes, the clothes are invading the living space. Well, not really--there is a little niche next to the closet that's not good for much. It's practically part of the closet. 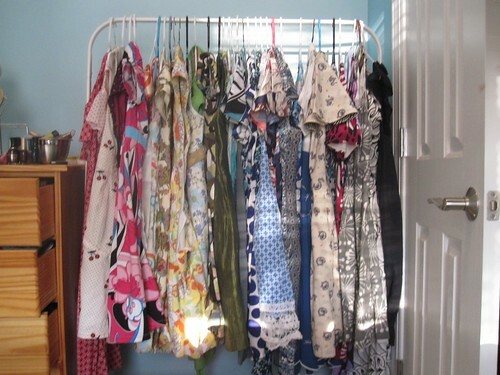 I moved (most of) the in-season dresses to the rack and arranged them by color. I love to look at them. I made the mistake of counting them and I have--to engage in some spin--only a little over a month's worth. That's not too many, right? What do you do with the clothes you've sewn when it's time to let them go? Thanks, Slapdash, I needed this post. My husband asked me to get rid of 10 items because he can't get my clothes into the closet after I iron them. I just HATE to get rid of something I put a lot of work into. But I do have some I really can let go of; just need to make the effort. Fortunately, the Homeless Veterans will have a truck on my street this Saturday, so out they go! And for the record, owning that many dresses shows great forethought and a sense of practicality. I mean what might happen otherwise, if you were unable to do the laundry for a month?! It is hard to part with something I have put alot of sweat into (literally and figuratively! ), but at some point it becomes necessary. I tend to get rid of the things I haven't wore in at least a year or the things that are really starting to show the wear. If they are still usable they go to the thrift store in town, if not they go down in my husband's shop to become rags. And once in awhile if I dearly love the fabric, I may refashion it. I jumped on the maxi dress bandwagon and now...not so much, so the fabric will now morph into new tops! I have too many too - time to clean the closet again! Thank you for the look inside your closet; it's gorgeous and fascinating, and I bet a lot of us now dream of having a months' worth of cute dresses! As to giving away clothes, I'm evenly attached to rtw and sewn clothes. I don't sew that much, and either the stuff is pretty pedestrian so I can let it go or it's special, then I keep it. BUT I have the hardest time letting go of the kids' clothes which I admittedly love more than my own stuff, and which are pretty much all special to me. I have only let go of a couple of things so far when I knew the new owner's mom fully appreciated the effort and special materials that went into them. We don't have a lot of closet space, so it's high time I find a solution for this. Sigh. I love the stuff you make so much it's a pain to see it carted off to Goodwill to 'maybe' be thrown away. Just wondering, have you considered a consignment store? There is one were I live that has all sorts of handmade and vintage items, I love going in there, and the owners definitely have an appreciation for a handmade garment. Also, it would help fund MORE sewing projects. I think I'm as ruthless at culling the stuff i make for myself as i am with the stuff i buy. I am holding on to a few handmade items for my DD for when she's an adult, but otherwise, her clothes all go to friends, eBay or Goodwill when she outgrows them. Trena - I've learned to be ruthless about this too. I mean I have lots of fabric, patterns, notions, etc and I sew all the time. So the garments that leave will be replaced by new favs. That makes it easier to let them go IMHO. Trena, purging is a good thing. Purging is a must for me. Closet space is like prime real estate for me as I am in a tiny studio in NYC. I usually do it on a couple times a year and take the items to the Salvation Army. If I haven't worn something at least once in the year, it generally has to go. It is gut wrenching at the time I am doing it but, once the item is gone, I don't miss it. This is what makes sewing so great; you can remake any garment/pattern (with any appropriate tweaking). Often times the subsequent versions are even better. I understand how you feel about parting with things you spent your own time to make. I also understand the need to make room for the new! I doubt that your old clothes are unwanted. Second hand shoppers are a special, canny breed, I think. Sometimes I repurpose them into something else or give them to my sister and let her agonize on giving it away. If things make me look weird, or I've clearly moved on from the style, it's so long. There's a few archival items sure, but the earth would cave in below my home if I kept all the clothes I've made and acquired over the years!!! Things in good shape go to charity. Some items get ripped up for rags - cotton makes great dust rags and I'll use them till they disintigrate. When I saw the title of your blog post, I feared the worst that you were giving up the blog! So thankful that it's just the clothes. If you lived in a suburban home w/ a walk-in closet, your dress collection would be perfectly fine. Us apartment dwellers can't feel guilty about the amount of clothes in our closets, because the closets are miniscule. I actually love to get rid of clothes, sewn or RTW. I hate clutter and hanging on to things that don't work. This past year I've been sewing, when a piece didn't work, I've pitched or donated it, really without compunction. Life's to short to wear meh clothes. My Mom is about my size, so she gets most of my RTW hand-me-downs. And if they don't fit her, and they are relatively cool, they go to my 20 year old little sister. My sister came up to visit a few weeks ago wearing a pair of my cast-off Born sandals. But she was also wearing a necklace I had given my Mom as a gift. OUCH! I have struggled with this as well. It's sooo hard to part with something I have put so much time into. But I have actually been thinking about this lately and am starting to get to the point where I think I could be willing to do this. This was a great subject to bring up. When it's time to part from selfmade (or bought) clothes....I keep them hanging in my closet for another few years. That's how hard it is for me to say goodbye. Once I'm brave enough I put them in bags....and they are stored in a room for another few years because I still can't say goodbye. However, this summer I've been cleaning out and I must say that I did a great job. I am getting a bit tired of the 'full closet, no clothes to wear' syndrome. I think it's amazing you make all of your clothes! It's always a joy when I see you've written a new post. I recently had a painful closet purge. Clothes that just don't fit. Luckily, I've started sending things to my mom. They will be well cared for and available to me if I ever lose 10 lbs. I agree with the comments that you could probably sell on Etsy or Ebay, or have swaps or give-aways. As for myself, thus far I don't feel any more attached to items I've made than I do stuff I've bought. For me, the enjoyment of the sewing process is kind of divorced from the enjoyment of the final product. Not sure why. I do purge but there are some jackets I've made that I just don't want to get rid of. I do have more space and fewer clothes than you so it's not really a space issue, but it is an organizational issue to me. I am a big believer in getting rid of stuff. (I still have more than I need.) When getting rid of clothes, I stick them in a black garbage back that I hold onto for 3 months. If I pull something out of the bag to wear, I keep it. RTW clothing purges are easy. I find getting rid of the stuff I've made to be a LOT harder. I'm getting better about it-- though often I'll go through a cycle where if I didn't wear an article of clothing at all that season, I'll pull it into the reconstruction pile. (Especially in cases where I still have leftover fabric from the project--that happens a lot too--or there was a lot of fabric in whatever it was to begin with.) If it's sat in the reconstruction pile for awhile, then it's time for it to go. I tend to be one who falls in love with fabrics more than patterns, so I find those prints hard to let go of! And for me, repurposing clothes has been a great tool to experiment with designing my own stuff where I might not with a piece of flat fabric that's suitable to use patterns with. This past year I gave up a nice size closet for the smaller one in my sewing room - With a smaller closest I purge more often and if a garment has not been worn in a year... off to family members or to a church. I have a lot of closet space but I still purge several times a year. I have no trouble whatsoever donating items I've made. My mission is to wear and love every item in my closet so I don't feel bad giving away anything that doesn't work. Nice post. Initially, I had problems with letting go garments that took alot of time and/or detail work. 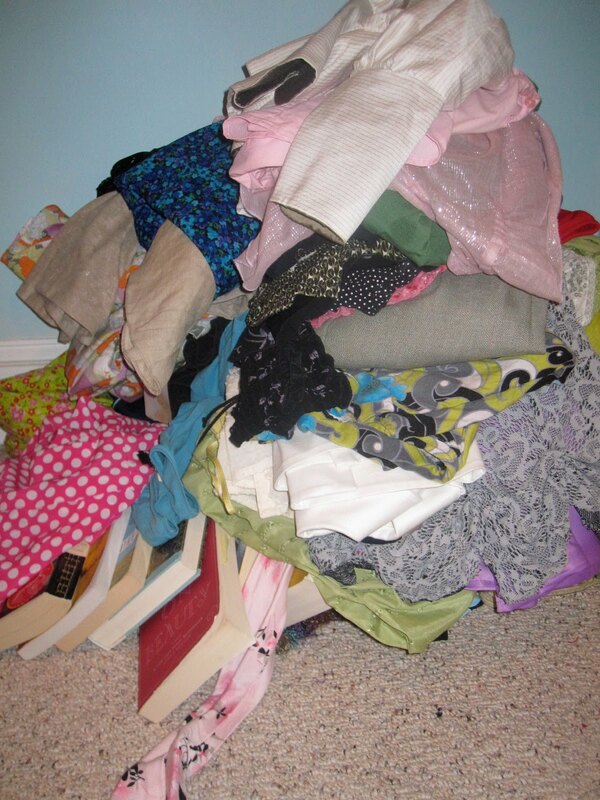 But as my closet brimmed with custom clothing I gave more away to goodwill, family and friends. So I will continue to create and replenish "the closet". I love clothes and I love making them. So from one clothes horse to another let's continue to satisfy our craving for beautiful things. Goodwill. Or Salvation Army. Or the womens shelter if they're office appropriate. Ahh, some of the suits I used to wear have shrunk considerably while hanging in the closet. Amazing how that happens. Leftover or unloved fabric goes to the RuMage sale our local guild has once a year, where they become someone else's cherished prize. Every three months I do a closet clean-up and purge. Any worn out clothes get chucked. Any still-wearable or out of style or I-am-bored-of-this clothes get donated to Good Will. Then I make a list of what I need to fill the gaps. But, alas, my closet is still packed. I think the real solution is just to get a bigger closet! I don't have any problem donating any wearable clothing. I drop them off in a St Vincent dePaul box because I drive by it regularly. I also donate clothes that former tenants have left behind. Hey, I can't keep every little thing someone forgets to pack up and move when they go. I'd be overjoyed if I found the middle dress in the charity shop!!! Since I've only made one dress so far, I've not had to deal with that dilemma. Unfortunately I'm a terrible hoarder, so if it does ever come to me having to part with my home made wares I'll have real issues. I'm sorry, what? Let them go? Go where? I love that you make all your own clothes and have so many winners. Actually I'm fairly envious that you have worked out your fitting problems and can sew and have a wearable outfit at the end! Love it. I hope someone sees the love and labour you've put into your clothes when they go to the charity shop. I would be very pleased if I every managed to have a month's worth of pretty dresses in wearable condition. Definitely not too many. Since this experience I try to a)make more clothes for myself, as I don't seem to buy much RTW even when almost clotheless and b)throw them out/turn them into rags when past their use by date, but it is tough. I don't have any trouble tossing knit shirts and trousers though. My wardrobe is looking rather full too. I've been selling my store bought clothes on ebay. If they are well made you could consider selling on ebay or etsy. Oh my! I only wish I had your output so that I had to do a huge purge like you have. That photo of your dresses hanging on the clothes rack is delightful. What a lovely array of colours and prints. It would be lovely to be faced with that choice each day. Still, your post makes me think, and I have to face up to a bit of a purge as I have some things that are just not getting warn. My parents have two huge houses, so when I moved across France and had to leave a lot of stuff behind, I left the handmade clothes that I don't wear in a wardrobe over there. Obviously this year, I don't need any purging - I did so little sewing, and only bought a couple of knit tops. I live in a small NYC apartment, so I've never had the space for racks of stuff. I clean my closet monthly, and donate everything I haven't worn in a year to Goodwill. I've stopped buying RTW also, and when I sew I try to make things that can be worn all season. When I do donate my handmade clothes, I cannibalize them of things so I can use them again -- zippers, and especially buttons. I try to be realistic with my creations. I don't want to hold onto something just because I made it, and I don't want to wear something just because I made it. I'm ruthless. If it's not worn, it's off to Goodwill. I keep a few inspiration pieces (i.e. Japanese kimono, china silk padded jacket), but if I made it and don't wear it, buh bye. I haven't been sewing for a long time and did not make many garments, so I still have them all regardless if they fit or if I sewed them well or not. But I have a very hard time getting rid of any clothes. It's my upbringing, I'm afraid. My problem is the opposite: I hardly have anything in my closet (RTW generally doesn't fit) and an item is just as likely to be worn out as given away. Interesting observation about the Butterick dress front. I wouldn't make it as all that fabric covering my large chest and going up so high, would have been unflattering (the dress would wear me instead of me wearing the dress). Now, maybe if I were 5'9" that wouldn't be an issue, LOL. I am more likely to part with clothing through Freecycle, where I can describe the sizing and fabric, etc. Or to other members of my family (my mom has the same size chest, but a much smaller bust, so the early pieces I made fit her perfectly, before I realized I would have to make a lot of alterations to fit my larger bust). If 'too many cats' is defined as one more than you have yourself, then you definitely have too many clothes for me :-). I'm envious, but then again I don't have the energy to sew that much, so there you go. I think I hang on to my clothes till they're more worn than I would if I didn't make them. And my non-sewing sister used to be appalled that I'd throw out anything at all, and encourage my mother to fish them out of the garbage to save 'for me'. But really, life's not that short, and if you start accumulating stuff just because you made it you'd soon be buried under it. Goodwill it is! May I suggest though my technique - safety-pin on a label with size and fabric content/care. Then the recipient doesn't have to burn the seam allowances to guess :-), and the staff can file them correctly. oh you're so brave - I wish I could send mine off to goodwill. But unless the fabric is totally trashed (from bobbling or stains or whathaveyou), I just can't part with things I've sewn. Though thankfully, there isn't much I've made that I don't like or that I've outgrown, and for my pre-weight loss clothes, my mom happily gave me a new home. But I recognise at some point that my output will overrun my available space and I will have to send some away. But I think I'd offer them round to the neighbours before the charity shop bin. I applaud your strength! I think we're close to the same size... Next purge let me know, I'd love to be the happy recipient of your lovely creations and would pay for shipping. When I sewed years ago I gave some stuff to a homeless shelter. Later I saw some of the staff wearing the items and it was a wonderful moment to realize that my things were nice enough for others to want to wear. I've begun to sew again and have been at it for a few months. I'm keeping things now just so I can see my skills progress.